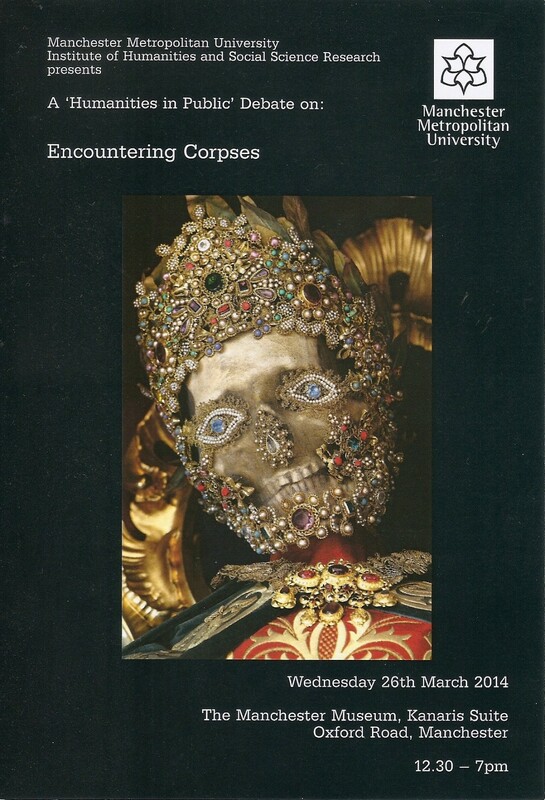 A few weeks ago I attended Encountering Corpses at Manchester Museum – a conference organised as part of Manchester Metropolitan University’s ‘Humanities in Public’ programme. The conference reflected upon some of the many contexts in which we encounter the dead, from archaeological excavations and dark tourism to representations in art, politics and the media. While historically we have often thought of human remains as passive and neutral, stripped of agency and identity, this debate encouraged us to re-consider the agency, materiality and mobility of human remains as well as the ethics that surround different encounters. Encountering Corpses conference at Manchester Museum. The conference included a series of talks on human remains in a museum context, and, as speaker and Curator Dr Campbell Price explained, Manchester Museum is certainly well placed to host such a discussion. The Museum is considered by many to have started the inter-disciplinary study of human remains with some of the earliest scientific mummy un-wrappings conducted by Egyptologist and Archaeologist Margaret Murray in 1907. Since then the Museum and Manchester University has been at the centre of scientific investigations into ancient Egyptian human remains with the Manchester Mummy Project, the Ancient Mummy Tissue Bank and the KNH Centre for Biomedical Egyptology. It is a connection that seems to have always fed into the display of ancient Egypt at the Museum. Dr Bryan Sitch, Curator of Archaeology at Manchester Museum, presented a talk on the display of human remains in the Museum’s recent Lindow Man exhibition (2008-9). This talk highlighted the role of public consultations as an approach to making museum displays more transparent, inclusive and accountable. Public consultations for Lindow Man revealed that visitors wanted “the body to be treated respectfully and for [the Museum] to reflect different interpretations.” These responses were incorporated into the display with a wide range of people interviewed from forensic archaeologists to pagan community group members. However, this multi-vocal interpretive style received mixed reviews from the visiting public with people questioning the authority of the voices represented. The exhibition also provided an opportunity for visitors to answer the question ‘Do you think it is right to display human remains?’ – over 12,500 comments were received with 67% of visitors saying that museums should display human remains. It was interesting to hear that these consultations had a wider impact within the Museum beyond the Lindow Man exhibition, contributing to the re-display of ancient Egyptian mummies in the new Ancient Worlds gallery. 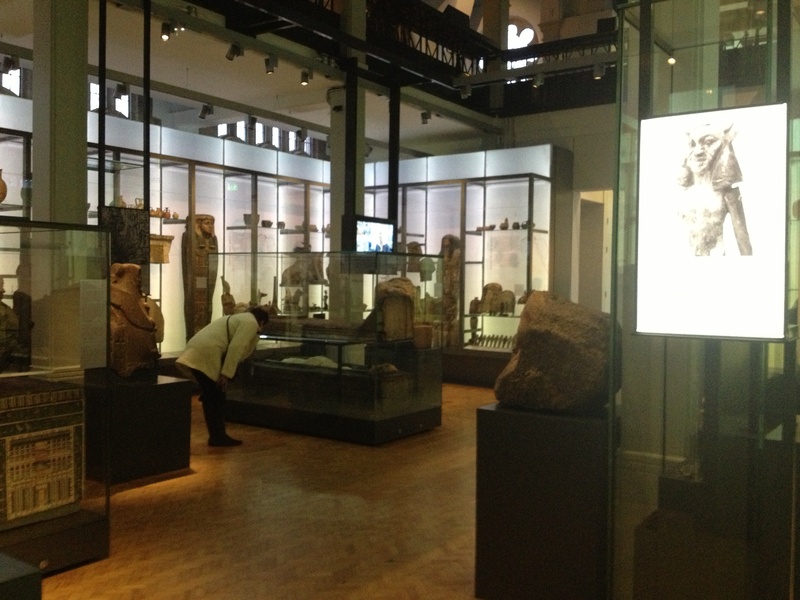 A visitor examines the preserved body of Asru in the Ancient Worlds gallery. Dr Campbell Price, Curator of Egypt and Sudan at Manchester Museum, spoke about how displays of ancient Egypt have always provided a unique encounter with human remains – one that certainly seems very different from any other within the museum setting. This talk examined how those responsible for the display and interpretation of Egyptian mummies have the difficult challenge of managing visitor’s pre-conceptions, high expectations and a fair amount of skepticism. The preservation bias in the Egyptian archaeological record has resulted in museum narratives that focus predominantly on death and the afterlife. For Dr Price, who has recently curated the re-development of the Ancient Worlds gallery (2012) including the re-display of human remains, this historic portrayal of ancient Egyptians as a culture obsessed with death, coupled with our familiarity with mummies in the popular imagination, has made it difficult to bring new perspectives to their display and interpretation. This talk examined how the fictionalisation of Egyptian mummies has resulted in their “hyper-real” status, leading many visitors to question the authenticity of the human remains on display. Historically this has not been helped by the nineteenth century practice of creating mock-contexts and mock-biographies for mummies on display. While it is often felt that the preservation bias in favour of funerary archaeology can dominate the museum space physically, Dr Price was also keen to highlight the unique value and potential of this evidence in guiding how we present and interpret human remains to a museum audience. This wealth of textual and archaeological evidence allows us to understand ancient Egyptian beliefs, as well as their expectations and intentions for their own human remains that could help to inform museum practice. Furthermore it can provide significant interpretive information to help visitors understand more about the person rather than the ‘mummy’.